Unlicensed and uninspected breeding has to stop. Please cross post our latest press release. Lets make 2011, the Year of the Rabbit, the year that unlicensed breeding and crulety stops. New Year Resolutions – how you can help improve rabbit welfare. Please make one of your New Year resolutions helping to improve rabbit welfare. Our membership is our main source of income, so if you love rabbits, please join or ensure you renew your membership when the time comes. Members receive a copy of our fantastic quarterly magazine and help us fund many projects such as our campaigning work, the helpline which is open 365 days a year and leaflet production and distribution. If you already a member (thank you) please sign up to pay by standing order, or world pay recurring payment, so that we can save admin costs on renewal notices and you can be certain never to miss an issue of Rabbiting On. It’s powered by Yahoo and you can raise money for rabbit welfare simply by browsing the web! It won’t cost you a penny and it’s really easy to use. Use ‘ easy fundraising’ for shopping. You can shop with 2000+ Brand Name retailers and to raise funds you just use the links from our site first – it’s that simple! Please register and share this link and (perhaps in your e-mail signature) and encourage others to support us too. You can also ‘like’ the page via facebook and share it to your wall. This will help raise awareness of the charity and our message. Use our ‘cruel’ image in your e-mail signature or as your avatar on facebook. 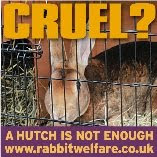 Help us spread the message that ‘a hutch is not enough’ If everyone used this image as their avatar, or in their e-mails even just for the rest of this month it would really help to raise awareness of the campaign and the website where people can find loads of information on how best to look after their rabbits. Ask for a free car sticker! Most of us have probably encountered a friend, neighbour or work mate that has a single rabbit kept in a hutch in the garden. We know this isn’t how rabbits should be kept and you might lose sleep thinking about the poor bun, but it can be awkward to approach the subject. Why not ask for a bundle of our leaflets to pass to them instead, and let them do the talking. You could always say you have read them and they may find them interesting to avoid making it confrontational. And we will receive 15% of the total spent. Used stamps can be turned into much needed funds for The RWAF. All types of stamps including first and second class, commemorative, foreign and First Day Covers are welcome. Simply send to the Horsham P O Box. The RWAF team would like to wish you and your bunnies all a happy and healthy 2011, and thank you for supporting us. Alan, Anne, Lizzie & Rae. Bring hutches and runs into sheds or unused garages (with windows) for extra protection, or cover with a purpose made hutch cover. If you cant get your hands on one, then a tarpaulin can cover the hutch and run, and keep their hutch area dry. Water bottles are likely to freeze, so keep a spare to change during the day and last thing at night, and invest in a bottle cover to keep them insulated. Add extra bedding and make sure the hutch is kept clean and dry, or it won’t be warm. A cardboard box filled with straw and placed in the hutch provides extra insulation and warmth. And products like ‘snuggle safe‘ are best used over night when the temperatures really plummet. Don’t bring bunnies in a warm house to play, and then put them back out into very cold temperatures. And don’t forget to stock up on their supplies – food, bedding and hay. We have checked with Santa Paws and he said that he won’t be carrying extra rabbit supplies this year! Argos hutch – 77 cms long the story so far. Argos are selling a hutch, 77cms long that they describe as allowing the rabbit to stretch and run freely. We all know that that can’t possibly be the case, and that these hutches are cruel, and would not be suitable under any circumstances. Trading Standards have been contacted and are not able to help unfortunately. Argos have chosen to ignore our advice, so we have been sending press releases for the last few months to build awareness of our campaign and gain support. The most recent press release last week gained some good coverage, notably with The Guardian’s website picking it up, but also local press, local radio sations and specialist magazines. So far, Argos have added text to the description of every hutch that says they should be used in conjunction with a run, and that they will offer a discount to anyone buying a hutch and run together. It is progress, but we would like to see them review their whole range, stop selling the really tiny hutches like this, and offer something more suitable.